Dealer Helps Tacoma Schools’ In-Plant with RSA Software | Industry Analysts, Inc.
By Elisha Kasinskas, Rochester Software Associates – There’s a wealth of opportunity within vertical markets for Web to print solutions and one market that offers resellers of production printers, MFPs, and workflow software more than a few nuggets of opportunity is education. It wasn’t that long ago—2013 to be specific—when the Tacoma, WA school district’s K-12 in-plant launched a Web to print solution. That solution enabled it to reduce costs and drive volume to its centralized print center. After a few years of success, budgetary issues impacting the district presented an independent office technology dealer in the Pacific Northwest with an opportunity to help the district reduce costs even more. 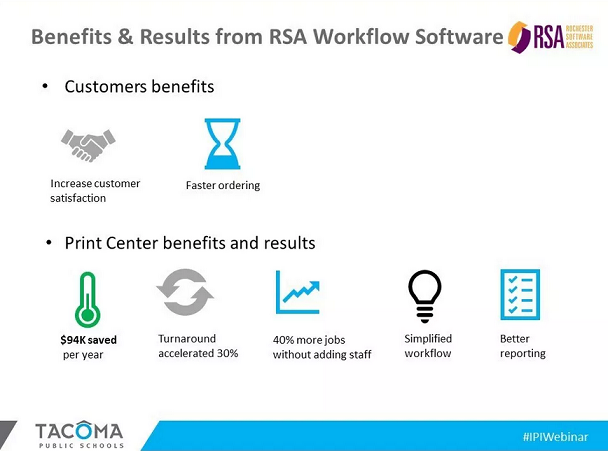 This resulted in initiatives to reduce print “leakage” at MFPs— and the development of a print governance policy— all with the help of one of the district’s production equipment dealers and Rochester Software Associates (RSA), their workflow solutions provider. This entry was posted in Rochester Software Associates and tagged education, in-plant, print, production print, rochester software associates, rsa, Tacoma Public Schools, Web-to-print by IA Staff. Bookmark the permalink.